Pat Turow and fellow hikers at end of 900 km hike from Port Stanley to the Northern Cairn of Bruce Trail at Little Tub Harbour in Tobermory. Each showing special badges made to commemorate the unique hike. Fall 2001. 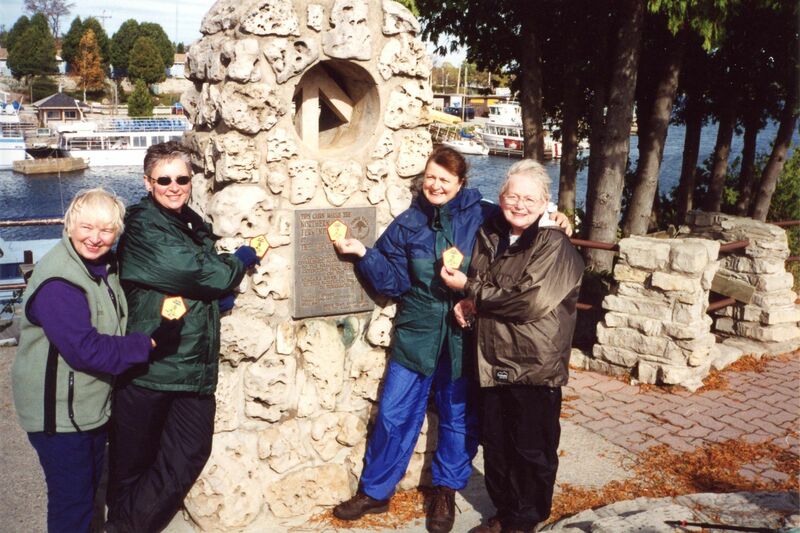 Picture above shows Anne Faubert of London, Ann Hoover of Aylmer, Loretta Vaughan of Port Stanley and Pat (seventy at the time) after they hiked 900 km from Port Stanley to Tobermory over five years. Pat’s favourite memories of the trip were using ladders and ropes to traverse the escarpment at Devil’s Pulpit near Orangeville. Pat and her husband Joe volunteered many years fundraising and other duties for the Elgin Hiking Trail Club, especially at the Spirit Walk. Loretta talks of this hike regularly and how much they all enjoyed the challenge, well maybe not the waist deep snow and wicked thunder storms. Sincerest condolences from the Elgin Hiking Trail Club. Card of thanks to trail maintenance crew. Written by admin on July 6th, 2016 July 6th, 2016 . Card from Elgin Court Public School Way-2-Green Environmental Club. Received this week and it is nice to see that the teacher and students took the time to thank our trail maintenance crew. Nice to know others outside the club appreciate the effort put forth by our volunteers. Good job to our trail maintenance director Tom Beharrell. 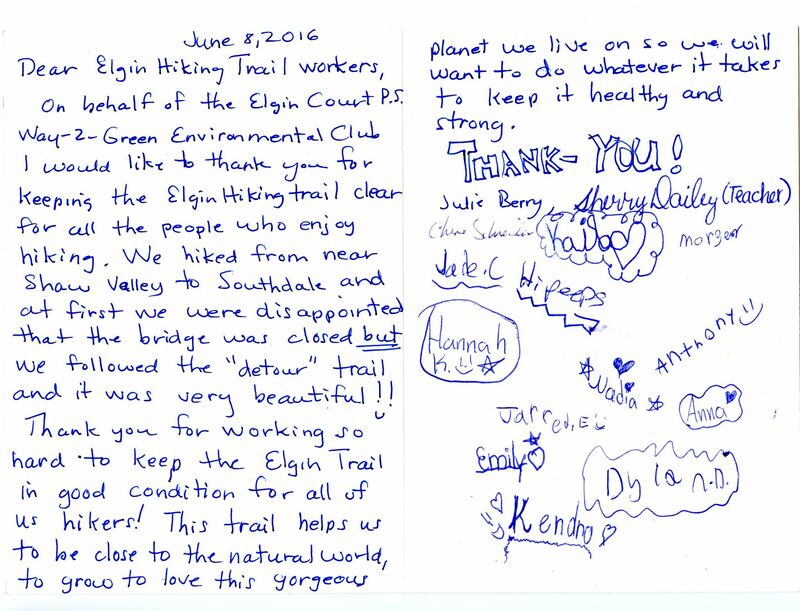 Read the article Card of thanks to trail maintenance crew. Written by admin on May 11th, 2016 May 11th, 2016 . Jim holds the new bench steady while Brian pours cement and Richard spreads it around. 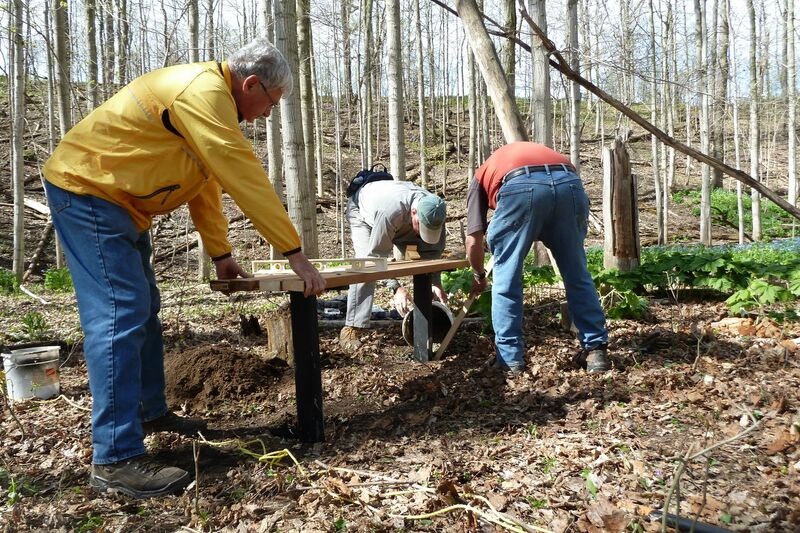 Weather was great for the crew to install the bench at the bluebells off Lyle Road. Special thank you to Green Lane Environmental Fund for providing grant to purchase the materials and Richard for getting the steel frame welded up. Written by admin on May 10th, 2016 May 10th, 2016 . Written by admin on April 16th, 2016 June 1st, 2016 . 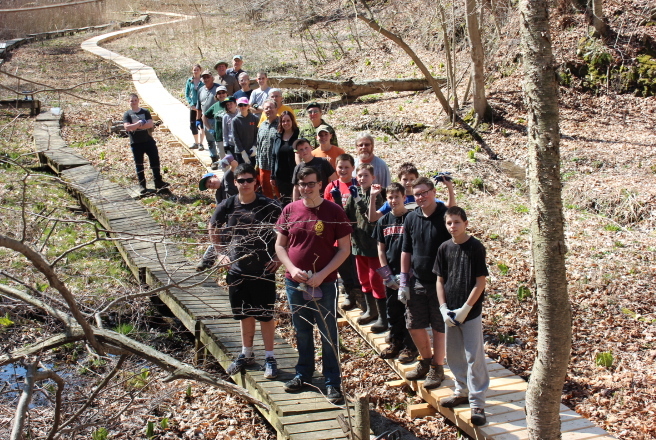 The weather could not have been finer, when 18 army cadet volunteers and their leaders showed up to assist in setting the 45 eight foot panels into place for the new boardwalk. Due to the excellent prep work done by Loretta Vaughan and Richard Wright everything went smoothly. Loretta figured all day and many hands made light work. The installation was completed in a little over 3 hours. The cadets were mindful of each other and when one saw another getting tired, the other quickly stepped in. The cadets truly made their leaders proud. Cathy, Jackie, Debbie and Loretta prepared a nice lunch for everyone, which we enjoyed at the Trout Hatchery. Special thanks to Kit for allowing us to use the facilities. Just a great setting for lunch and the cadets really enjoyed it. Special thanks also go to D J for supplying home made cookies for everyone. Parkside Collegiate Institute students under the supervision of Mr Haskell assembled the 45 panels. Richard Wright and Brian King brought them down to the location. Four by five inch locust was used for the base and all the panels were two inches thick and 32 inches wide on 2 x 8 frames. It looks amazing. Thank you to all the volunteers. We could not have done it without you. Splendid job! Build the Boardwalk Day this coming Saturday, April 16th. Written by admin on April 10th, 2016 . Meet at 8:30 am at the boardwalk across the road from the Port Stanley Fish Hatchery on Thomas Road off Union Road. The green space west of the hatchery is private property that we can park on. We will be installing a new boardwalk. St Thomas Army Cadets will also be helping. Lunch will be provided. For more info contact Loretta at 519-782-7550. Read the article Build the Boardwalk Day this coming Saturday, April 16th. Written by admin on February 16th, 2016 . As I write my last President’s Message I would like to say Thanks to the current Executive for all their support. Walking has always been my passion since high school and my service to this club has been because of this devotion; and the desire to improve the trail and make it safer. Our efforts as a club paid off as we celebrated our 40th Anniversary; all sections of the trail are now open; reroute off Sunset is completed; for safety reasons. Boardwalk funding and material ordered; just hoping the weather co-operates April 16th. Our membership remains constant; but if each of us asked just one person to join our club, membership would increase. There are many excuses for not taking responsibility but there are more for stepping up and doing what needs to be done. If you are at all interested in keeping this trail and club alive please call and I will help mentor anyone. Soon it will be Spring; so get out there and enjoy the best local hiking trail around. Written by admin on January 14th, 2016 April 18th, 2016 . 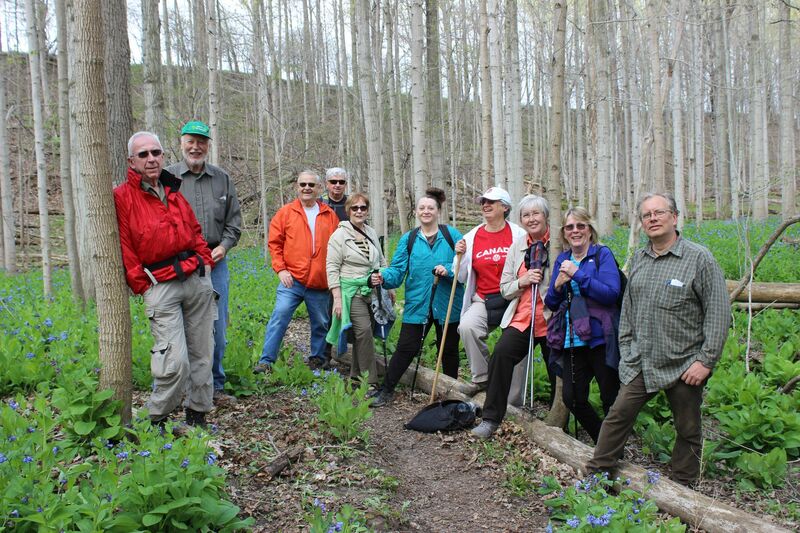 The annual dinner for the Elgin Hiking Trail Club is at 5 pm on January 30th. Please RSVP DJ Smale at 501-765-2029 if you would like to join us at the St Thomas Roadhouse, 837 Talbot Street. We look forward to seeing you there for a great meal and social hour. Written by admin on December 19th, 2015 . Special wishes to our landowners who give generously; by permitting us to walk on their property. A reminder trail is closed Dec 25th to protect their rights. May this Christmas season be filled with good friends, health and great hikes! Written by admin on November 17th, 2015 . 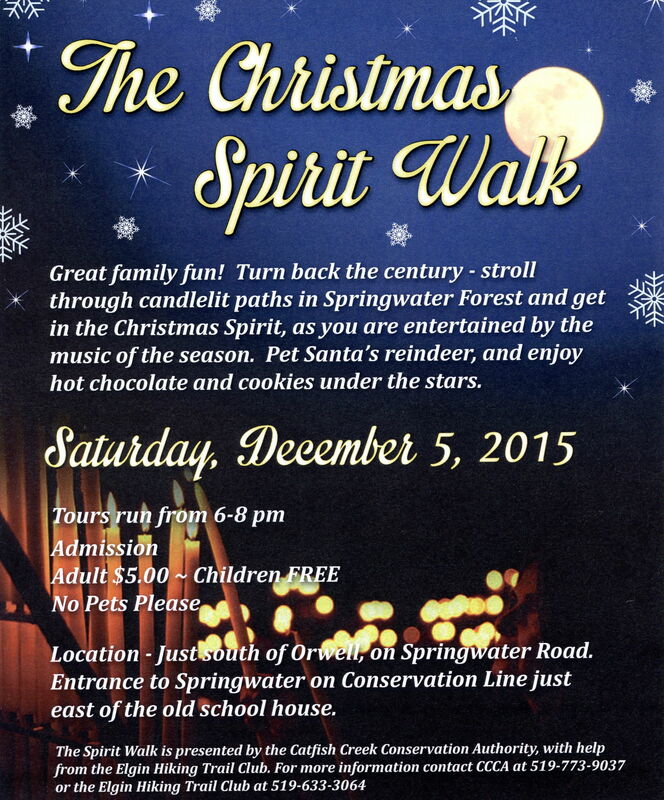 Catfish Creek Conservation Authority and Elgin Hiking Trail Club present our annual Christmas Spirit Walk.. The Spirit Walk is just around the corner. 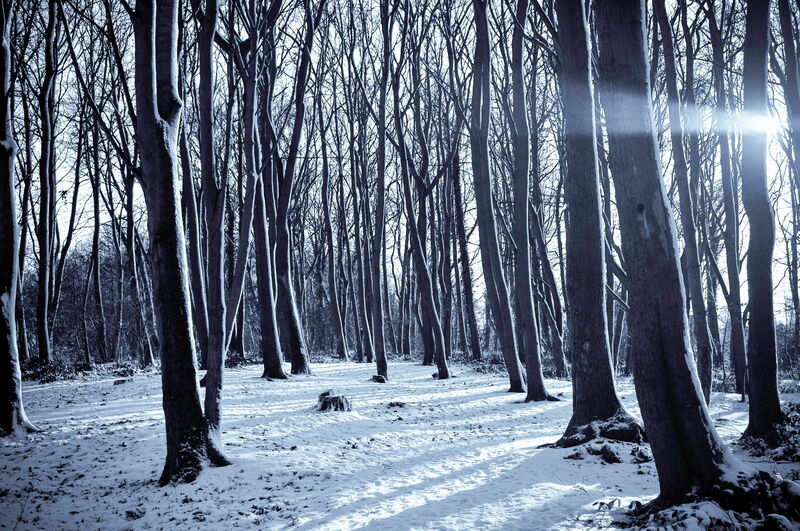 Bring your children or grand children to enjoy a scenic walk through the forest enjoying the choirs. Derek Drover will be entertaining in the school house with 13 young performers. Apple cider to warm the children before visiting Santa. Hope to see you all out their.